Sithonia is the middle of the three peninsulas of Chalkidiki, between Kassandra between in the west and Mount Athos in the east. It is also called Longos and extends to the southeast from the settlement of Nikiti to Cape Drepano, its southwestern edge. It has a length of 40 km and a width in the middle of 18 km. The shores are smooth and form coves and beaches with wonderful piney beaches. The territory in the interior is traversed by the mountain Itamos; its highest peak, Astrapokameno, is at 811 m. Formerly was called Dragoundelis. It was named Itamos from one itamos, a tree at the top among black pine trees, with a diameter of 1.2 m and perhaps 2,000 years of age. The tree itamos(or taxos, taxus baccata) grows slowly and is poisonous.According to mythology, the goddess Artemis used the poison on her arrows. The ancient Greeks made with its wood weapons, musical instruments and statues. Mount Itamos is a protected area of 200,000 acres, part of the Network Natura 2000. It is traversed by forest roads and trails that lead to wonderful landscapes with oak and pine trees and is a place for roe deer, wolves, wild boars, other animals and many birds. We go in Sithonia either from the interior road of Chalkidiki turning south towards Polygyros and continuing to the south or from the coastal road east of New Moudania. 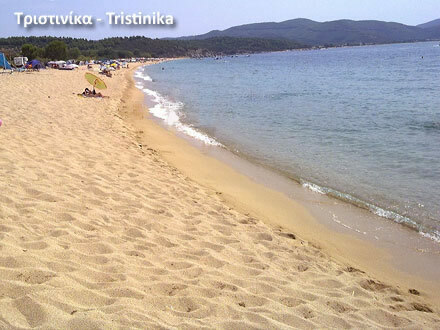 The distance to Nikiti, in the beginning of Sithonia is almost the same, 100 km from Thessaloniki. Most prefer the road near the sea. 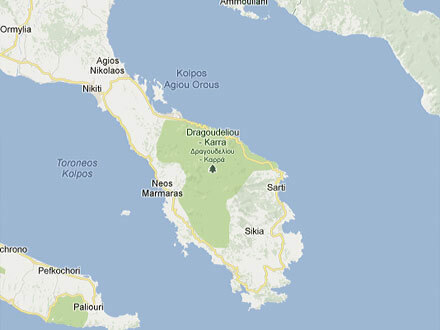 We can also come from the eastern side of Chalkidiki. In Sithonia, the road follows the coastline. We can make the round of the peninsula both from the west and east coast. 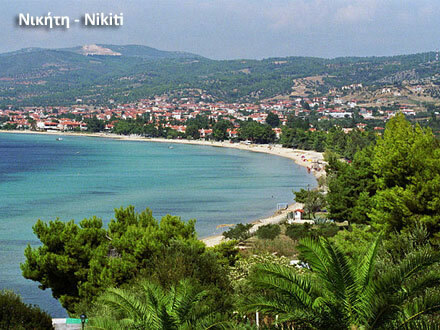 At the beginning of the peninsula, on the western side, the area of Nikiti welcomes us with pine forests, olive groves and beaches, along with tourism development. Nature favors the bees and the honey of the region is famous from old times. Nikiti is considered as the first settlement producing honey in Europe. At a crossroads as we come from the west, to the left we reach the old village of Nikiti and to the right the seaside settlement. To the left, the road twists to the old Nikiti in a green environment. The traditional settlement has existed since the 14th century. Narrow streets and stone houses with chimneys typical Macedonian, built after 1830; in the square, fountains and a tavern; nearby traditional guesthouses. Higher up the church of Agios Nikitas, built in 1867; great feast in its celebration on September 15. Near the chapel of the Assumption and below the old stone school built in 1870. On the other side spreads the seaside Nikiti. It began to be created in the 1920's and in the modern times developed into an important tourist area. It stretches along a long beach with tourist facilities, taverns and cafes. On the north side is the fishing harbor and just north the beach Kastamonitou with pines. Two and a half km south, near the coast, is one of the oldest churches in Northern Greece, Basilica of Sophronius, built in the 5th-6th century; aisled with a wooden roof and patio. The excavation began in 1981 and brought to light a magnificent mosaic floor and marble parts. It took the name of the bishop Sophronius, written in an inscription. Near is the small church of St. George. From Nikiti the main road goes southeast and at 2.3 km splits. Left, to the east, goes to Ormos Panagias (Bay of Virgin Mary) and from there follows the eastern coast of Sithonia to the south. Right, it heads south along the western coast. The road to the right reaches soon the west coast, and continues along the sea. At a distance of 15 kilometers, the coastal settlements are one after the other, with beaches, pine forests and tourist facilities. First is Aghios Ioannis,named after the small church next to the road, built in the 19th century. Northwest near is Kastri with an islet with the same name once connected to the small peninsula; beautiful beaches and turquoise waters. In the area was the great ancient city Galipsos, inhabited until the 14th century. South is the beach Koviouin a small bay surrounded by pine trees. Very near the famous Akti (Côte) Kalogria; beautiful beach, organized with green waters and natural beauties; shortly after another beautiful beach with white sand and rocks and immediately after Akti Spathies.A little further away a fork in the road leads to the church of St. Paul; in the area beautiful hiking trails. Further south is Akti Elias, the long beach of the settlement Elia with pine trees and olive groves. In the area are other smaller beaches. Then it is Perigiali and then Lagomantra with pines beside the sea; further south, the settlement Tripotamos with a beautiful beach. 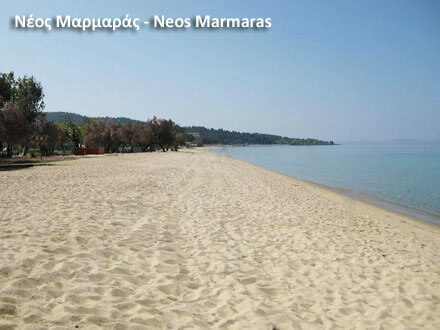 The main road after Tripotamos leads to Paradise in the area of New Marmaras; beautiful beach with shallow water on the north side of the bay of New Marmaras decorated inside by successive coves. Around these coves New Marmaras was built by refugees from Asia Minor after 1922. Until then the rocky area belonged to the monastery of St. Gregory on the Holy Mountain. Today is one of the most beautiful and famous areas of Chalkidiki. New Marmaras developed since the early 1970's, when a little further south, the large resort of Porto Carras began to be created. It is one of the most cosmopolitan areas of Sithonia; sea and green, beautiful landscapes and tourist infrastructure with many possibilities for accommodation, fine dining, shopping and entertainment. The settlement is built amphitheatrically over four bays. In the first are the old fish-taverns with tables on the seashore. In the second and third bay are the most taverns and cafes. Here is the port; on a hill the church of the Archangels. From the fourth bay begins the long beach of New Marmaras with taverns and bars, extending to the region of Porto Carras. The area offers beautiful walks by the sea, as well as inward. To the south one path among pines follows the shore watching opposite, southwest, the island Kelyphos (Shell), or Chelona (Turtle). It has an area of ​​1 sq km, a length of 1.5 km and a width of 700 meters. As the name says it looks like the shell of a turtle. It has a height of 148 m and steep slopes with pines, olive trees and wild rabbits – attention they bite. We can go by small boat from New Marmaras combining the visit with swimming. The distance to the small port on the northeast side is 2 nautical miles. Shortly before New Marmaras one road leads inwards after five kilometers to Parthenonas,one of the prettiest villages with narrow streets and stone houses, built in a green landscape at an altitude of 350 in the western foothills of Itamos. According to one view it took the name from the ancient city Parthenopolis. In Byzantine times, the settlement Parthenona is mentioned, a dependency of the monastery of Kastamonitou on Mount Athos, but its place is not certain. Parthenonas has been declared a traditional settlement. When in the 1970s New Marmaras developed, the residents came to the coast and settled on the west side. More recently they began to return with others. There are taverns and hostels and in the old school a folklore museum is housed. Paths lead on the slopes of Itamos. 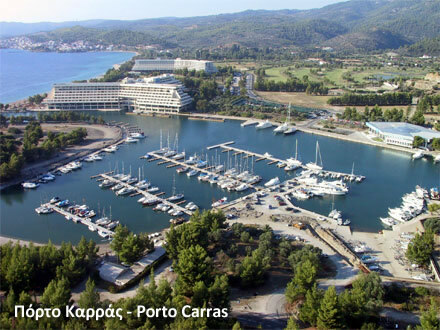 After New Marmaras we reach the region of Porto Carras, the internationally renowned resort with endless olive groves, vineyards and pine forests. In the late 1960's John Carras bought the land, which was monastic property, and in 1973 began the construction of the complex, a revolution in tourism in Greece, which laid the foundations for the development of Sithonia. The total area is 17,630 acres. The vineyard is 4,750 acres and the olive groves have 45,000 trees. The private beaches, with a length of 9 km, include 25 private bays. The tourist installations cover an area of ​​130,000 sq m, built around a marina for 315 boats. There are three hotel complexes and the luxury guesthouse Villa Galini (Serenity), built on the architectural standards of Mount Athos. Villa Galini has hosted international celebrities of politics, economics and art. The complex hosted the 2003 Summit of the European Union. Open all year round with a casino. It has, among others, a golf course with 18 holes, a series of pools, a playground, conference rooms and the largest thalassotherapy center (spa) in Southeastern Europe. The vineyard of Porto Carras is the second largest in the world. Unfolds amphitheatrically, designed in an exemplary manner. The varieties were selected by experts for the local environment. At the center is the winery with a production capacity of 2,500 tons per year; white, rosé and red wines are produced. The excellent varieties of Porto Carras have gained high reputation and won numerous international awards. Near the winery there is a place for visitors, who are guided to the installations and cellars and they taste the wines and watch videos on the estate and production. After Porto Carras a road to the right leads at 2.5 km to the coast. It's a road that leads south beside the sea, passing through magnificent landscapes, small coves and beaches, some even lonely. From Aghia Kyriaki we reach the beach Koutsoupia with pine and olive trees and three small islands opposite named Spalathronissia. After is a small beach and then a bifurcation ends in one km at Diaporti, a small sandy peninsula with some taverns, hotels and camping site. Opposite is the islet Punta. We take again the road beside the sea to the south and we reach Staladario; pines and a fine sandy beach surrounded by rocks. After other beaches, one after another, up to Azapiko, a long beach where a stream ends into plane trees. Furthermore is the small village Aretes with a nice beach; after the sandy beach Korakas and then the endless sandy beach of Tristinika. The beach Destenika is just before Toroni. From Toroni this road turns left towards the interior, reaches the large settlement of Sykia and continues to the east coast. 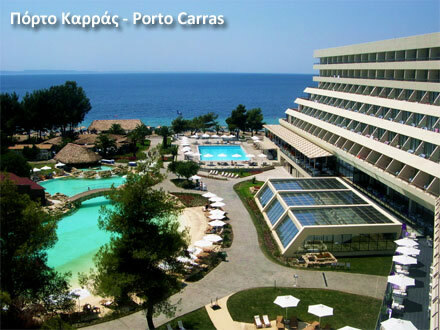 Toroni is a nice resort on the shore of the magnificent bay formed after the beaches Korakas and Tristinika. 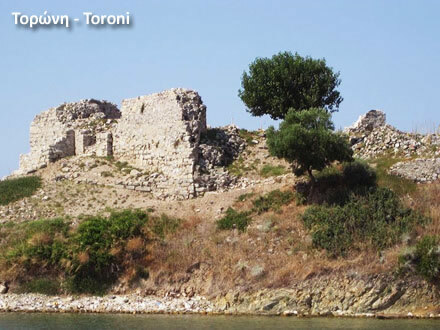 The settlement retains the name of the great ancient city Toroni in the peninsula that encloses the bay on the south. 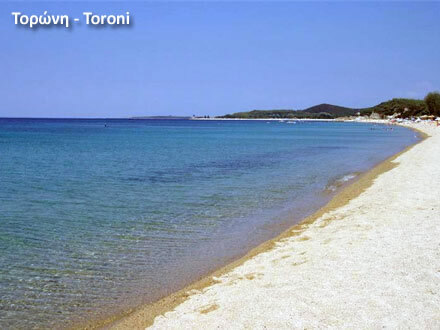 Toroni has tourist facilities and its beautiful sandy beach stretches along 2 km. At the edge of the beach are the ruins of the castle of Lekythos. At the rocky peninsula traces of installations from 3000 BC came to light. Here was one of the two citadels of ancient Toroni, founded at the end of the 8th century BC by colonists from Chalcis of Euboea. Remains of the walls of Toroni are of the hill Vigla. Excavations in an ancient cemetery brought to light important vessels. In the sea are the docks of the ancient port. The city lived until the Roman and Byzantine times. Taking after Toroni the main road we see on the left side the remains of the early Christian basilica of St. Athanasius built in the 5th century. Beautiful mosaics have been discovered. 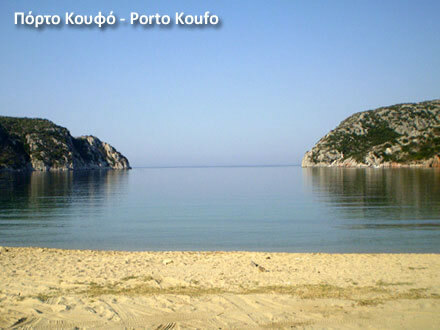 Further south the main road reaches Porto Koufo, an amazing bay, protected by steep rocky coasts, where are caves. It is one of the safest natural harbors in Greece. In ancient times it was an important port. Thucydides called it Kofos Limen (Deaf Harbor), because in the bay not hear the roar of the sea. In Byzantine times it was a base for pirates. The opening at the entrance of the bay has a width of 600 m. Close on the left side of the coast are the ruins of ancient Toroni. In the middle of the bay the width reaches 300 m and then up to 1,500 m. In the interior three small bays are formed. In one stretches a beautiful sandy beach; beside are hotels. In the northern cove are located the village and the harbor with taverns. Porto Koufo is the largest fishing spot in the area. On the hill on the left entering the bay are ruins of German emplacements of the Second World War. The locations for the cannons and the underground spaces of the fortifications still exist. We can go up there on foot. South of Porto Koufo towards Cape Drepano, the southernmost tip of Sithonia, spreads an area with spectacular coasts. The rocks rise perpendicularly a hundred meters or more. The area is called Kartalia. So the locals call the vulture-eagles. From Porto Koufo, the road turns east along the southern coast of the peninsula. A branch road leads to the beach Ambelos. Going to the second bay is Kalamitsi with a nice sandy beach, accommodation facilities, camping, taverns and beach bars. At the opening of the bay is a small island. The road continues northeast. A right fork leads to Kriaritsi with beautiful beach. North a wonderful bay is formed. West a fork leads to Sykia, center of the area. 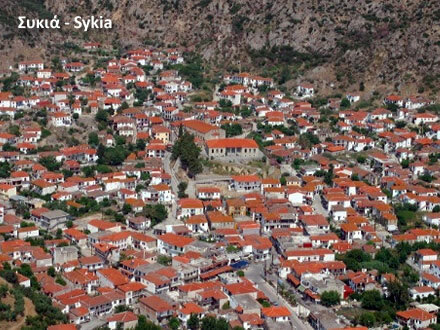 Sykia, a large settlement with 3,000 residents, is located at the southern foot of the mountain Itamos. It is one of the oldest villages with a tradition of beekeeping. Walking in the settlement we reach the two old school buildings, built in 1920 and 1870. Between them is the church of St. Athanasius; around the old village with narrow streets and houses from the 19th century. The architecture reminds the architecture of Mount Athos. Besides, in the region were dependencies of the monasteries. The village is mentioned in the 14th century with the name Longos. On the rocky hill Koukos are the remains of a castle. Maybe there was a prehistoric settlement. Beautiful hiking trails begin from Sykia; towards north we find roads and trails that lead through the forests of Itamos; towards south we reach the beaches. In the southern cove of the bay opened on east stretches the endless beach of Sykia, called Skala Sykias; is adorned with stone windmills. 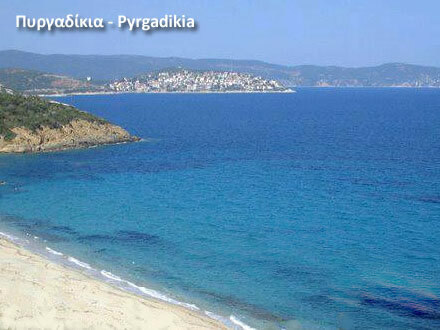 At the north side of the bay are the beaches Griavaand Valti; to the eastern edge of the bay is Klemataria. There are also Marathias, Tegania, Kleftolimano and other beaches; everywhere rooms, camping and taverns. From the area of ​​Sykia the main road follows the east coast reaching Sarti, on the shore of an open bay with white sandy beaches and turquoise waters. Sarti has the name of the great ancient city, possibly in the same position. In the 14th century there was an installation named Sartis, belonged to the monastery Xiropotamou of of Mount Athos. The dependency of the monastery was west of the village, where are ruins of stone buildings and a church built in 1867. Sarti was created after 1922 by refugees from Asia Minor. It is one of the first settlements which began to develop in tourism since the 1960's. There are hotels, rooms to let, camping, shops, restaurants, cafes and nightlife. The wide sandy beach is organized in most places; there are sailing and windsurfing schools. Boats make daily trips to Vourvourou, another beautiful area to the north, or on the opposite coast of Mount Athos. 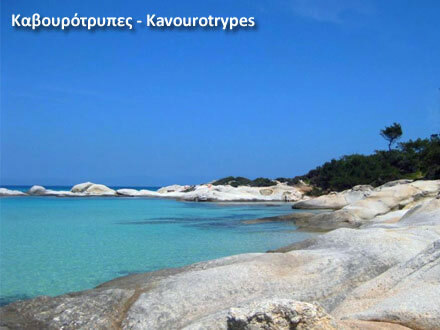 After Sarti is the beach Achlada with a fishing port; then follow other small coves up to the beach Platanitsi.Continuing north, we reach one of the most beautiful areas, Kavourotrypes (Crab-holes); is considered as the most exotic beach in Chalkidiki. Six bays, one after another, with amazing rock formations, white sand and turquoise waters. A rock is carved like a mermaid. Further north we reach Armenistis.The region took its name from the famous camping site here. In 1981, 50,000 plants were planted in an area where the largest camping in Greece was created; 120 acres of greenery and an amazing sandy beach. Water sports, pottery school, cinema and concert venue. North from Armenistis we reach the beach Zografou and Akti (Côte) Koutloumoussi and then we approach an enchanting region, Vurvuru. The settlement is located inside a large bay enclosed by the small island Diaporos and nine islets nearby. Magnificent coast, calm waters and to the interior the northern green slopes of Itamos with paths, trails and beautiful places with amazing views. The south side of the bay, before we get to the village from the south, is enclosed by a peninsula with enchanting environment. In the cove through the pines is a settlement with nice homes of Macedonian architecture integrated into the natural environment. They are built by members of the faculty of the University of Thessaloniki. On the other side towards Cape Xifara is the beautiful little cove Karydi (Walnut) with pine trees up to the sea; exotic beach, white sand and rocks like sculptures. The settlement of Vurvuru stretches on the coast inside the large bay with hotels, rooms to rent, shops and taverns; swimming along the beach; we may also go to the island Diaporos and the other islets. 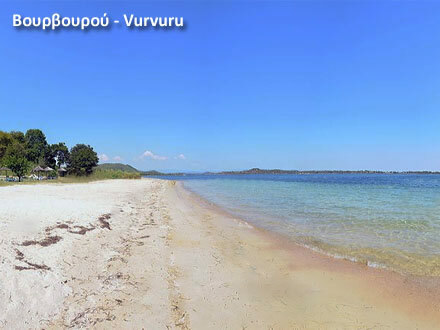 Beautiful coves and beaches are also north of Vourvourou. Opposite Diaporos is Livari,where a small lagoon is formed; also Karagatsi, Galini; further north Lagonissi, Phanari and Latoura. Then, very close, is Ormos Panagias. 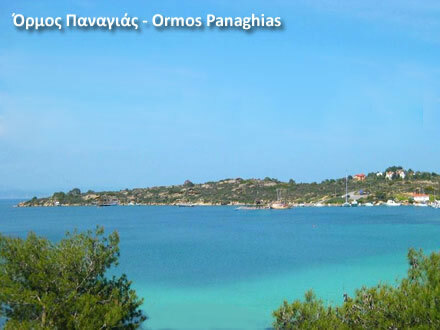 Ormos Panagias, (Bay of Virgin Mary, is a picturesque harbor located in the neckof the peninsula of Sithonia. It took its name from an old church of Virgin Mary. From here boats make trips to the peninsula of Mount Athos, and the settlement of Ouranoupolis and the island Ammouliani. We may also rent a small boat for the island of Diaporos and the islets in the bay of Vourvourou; a nice excursion. Diaporos, also called Vourvourou or Demetres, has a length of 3 km and a width of 1 km, adorned with trees, rocks and sandy beaches mainly on the south coast. 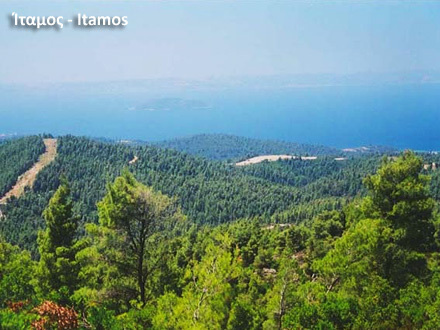 At the highest point, Koukos, at 53 m, was a prehistoric settlement. Near Ormos Panagias are the beautiful beaches and Livrochioand Trani Ammouda with tourist facilities and taverns. Ormos Panagias is the port of the inland settlement of Aghios Nikolaos, located 2.5 km northwest. The area has been inhabited since ancient times. Traces of prehistoric settlements have been discovered southwest of the settlement at the site Vetrynos. The inhabitation continued until the Hellenistic period. The current settlement was created in the 14th century. Aghios Nikolaos retains its character with narrow streets and traditional houses. In the central square, full of life and activity, we can taste local wine and rake. Of particular interest is the visit to the churches of Aghios Georgios and Aghia Paraskevi. 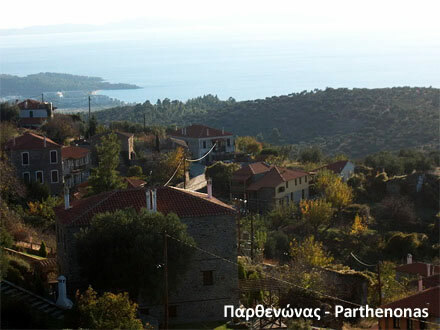 One of the beautiful walks around the village leads to the region of Jesma, Nipotamos and Keli. 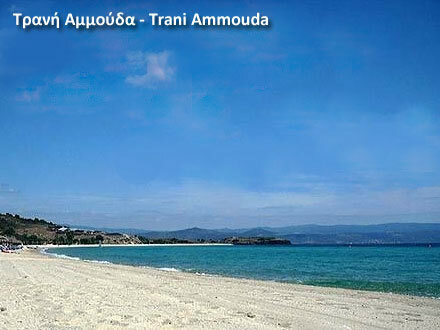 On the coast first stretches the beach Trani Ammouda with white sand. At one edge are the ruins of a tower and the foundations of the cells of a monastery destroyed in the 14th century. Next, the beach Pyrgos (Tower). On the small peninsula on the north side was a prehistoric settlement and the ancient city Singos,colony of Chalcis, which lived until the Hellenistic period. From this city the gulf was named Singitikos. The large cove of Singitikos Gulf or Gulf of Holy Mountain begins from the beaches of Agios Nikolaos. The coast continues north to the region of Pyrgadikia and then turns east. After the beaches Trani Ammouda and Pyrgos the road, away from the shoreline for a while, approaches after 10 km the Akti (Côte) Salonikiou with a large and beautiful beach. Shortly after, before we arrive to the beach Elaeonas, a road to the left leads in the interior. At 4km is the old village Metangitsi. In the area the ancient city Assa,Chalkidean colony, was founded in the 8th century BC. West of Metagitsi a nice trail leads along the banks of Chavrias, the largest river of Chalkidiki, where are a monastery dependency and an old watermill. East of Metangitsi, towards the coast, we reach the hill Tourkovigla, an old observatory at a height of 170 m from where the view is amazing. At the top is a church of the Transfiguration. We can also come from the coastal road turning just before the village Pyrgadikia at the western corner of the cove of Singitikos where are the small beaches Gyalakia. The settlement of Pyrgadikia was founded by refugees from Asia Minor. It is a nice resort with a small harbor, rooms to let and taverns. A chapel of Agios Dimitrios is built on ruins of an early Christian basilica. In the area are traces of ancient installations. On the other side of the small peninsula over the settlement was the ancient city Piloros. A wall around the peninsula was built during the Byzantine era. 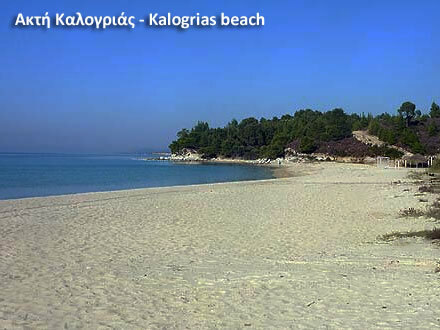 Within the bay on the north, immediately after Pyrgadikia, stretches the long sandy beach Kambos. A tower belonged to a dependency of the monastery Dochiariou of Holy Mountain. From Kambos in the cove of the bay up to the Cape Arkouda (Bear) on the east are beautiful small beaches. From Pyrgadikia the road goes inwards. After the settlement of Aghios Ioannis Prodromos it meets the road coming from the west, from Polygyros, continuing towards East Chalkidiki passing through the settlement Gomati. A fork leads to the gulf, where is Develiki with a beach and taverns. Around are small bays and near other sandy beaches; west Almyroand Chiliadou,east Kastri.